The Hall of Honors is located on the lower level of the North Dakota Heritage Center & State Museum. Featuring historic photographs and objects associated with the USS North Dakota battleship, this exhibit also includes objects and photographs of other vessels with North Dakota ties, such as the Gurke, named after Medal of Honor recipient Henry F. Gurke of Neche, N.D., the Devils Lake, the George A. Custer, the Arikara, and the recently commissioned supply ship, the Sacagawea. Christened in 1908, the U.S.S. North Dakota first sailed with the Atlantic Fleet in 1910. 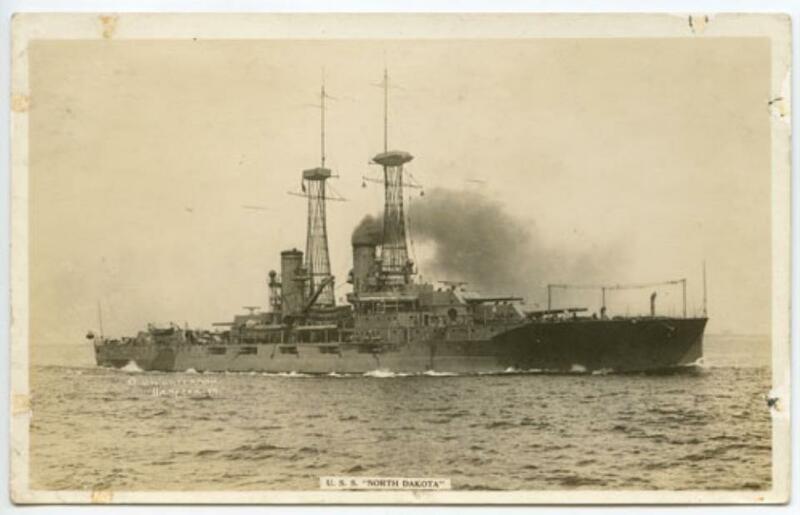 A “dreadnought,” the North Dakota was larger than any other warship in service at the time. She was 518 feet 9 inches in length, had a beam (width) of 85 feet 3 inches, and a mean draught of 26 feet 11 inches. After service primarily as a costal guard and training ship the North Dakota was decommissioned in 1923. While the ship remained on the Navy’s roster as a mobile target, she was never refitted for this use, and was finally sold for scrap on March 16, 1931. The State Historical Society retains the one ton bow place and 850 pound bell from the ship; both are on permanent display. This exhibit was made possible through the donation of items collected by Cleo Moore, a Bismarck resident and volunteer at the Heritage Center since 1989. The silver service on exhibit was a christening gift from the people of North Dakota to the U.S.S. North Dakota, although it was not actually presented until April 1915, seven years after the ceremony. Donations were sought from school children and the state’s citizens in general for its purchase. The service was made by the Gorham Silver Company; the design incorporates the motifs of the bison, wheat, wild rose, and corn, while the punch bowl is also engraved with scenes depicting early North Dakota and the U.S.S. North Dakota. The silver service was removed from the North Dakota when she was decommissioned in 1923 and was stored at the Hampton Roads Naval Yard. The forty-piece set, only part of which is on exhibit, was returned to the state for preservation and exhibition by an Act of Congress in 1926. The Secretary of the Navy formally transferred ownership of the silver service to the state in 1997. Every four years, portions of the silver service are used for the Governor’s Inaugural Ball.